제주위클리 모바일 사이트, The disappearing "Haenyeogut"
‘Haenyeogut,’ a traditional ritual ceremony praying for the safety of diving women and the prosperity of fisheries is being held across fishing communities in each village, having started with the fishing community in Jochun-eup, Jeju-si, this past February 9th. The Haenyeogut is jointly organized by 35 fishing communities on Jeju Island, usually between early January and early March in the lunar calendar, across coastal areas at shrines for the ocean gods. Depending on shamanic and Confucian ritual customs, it is called various names such as Yongwanggut, Yeongdeunggut, Haeshinje, and Sushinje. The ‘Yeongdeunggut’ is thought to visit Jeju every year on the first day of the lunar month of February, and returns to the mainland via Udo on the 15th. Meanwhile, Jeju Special Self-governing Province supported a part of the cost of these Haenyeogut rituals to preserve the traditional shamanic culture, and announced that it plans to survey and document the characteristics and form of Haenyeogut for each fishing village. Meanwhile, a survey that showed the disappearance of the Haenyeogut was published in January. The Jeju Special Self-Governing Province announced on January 9 that it carried out projects and surveys regarding the preservation of 'Jeju Haenyeogut (also known as Jamsugut)’ following the registration of the Jeju diving women culture as humanity’s intangible cultural heritage in November 2017. It was reported that 37 locations (35 fishing communities) across the island currently have a Haenyeogut tradition. Only 34% (35) of a total of 102 fishing communities on the island practice Haenyeogut. In particular, Haenyeogut has disappeared in Daejeong-eup Seogwipo-si and Hankyung-myeon Jeju-si. The Province believes that this is due to the fact that Christianity spread most quickly in Daejeong and Hankung, driving out the Haenyeogut tradition based on shamanic faith. Only two districts in Jeju City, Sangdo-dong and Gunip-dong, practice Haenyeogut. In Seogwipo, four districts including Bomok-dong, Hahyo-dong, and Daepo-dong currently practice Haenyeogut. Among towns and villages (eup and myeon), Seongsan-eup has the most number (seven) of communities which hold Haenyeogut. This is followed by 6 places in Gujwa-eup, 6 places in Namwon-eup, 4 places in Jocheon-eup, and 4 places in Hallim-ri where shamanic rituals and ceremonies are held. The most representative variant of Haenyeogut is the 'Jeju Chilmeoridang Yeongdeung-gut’. 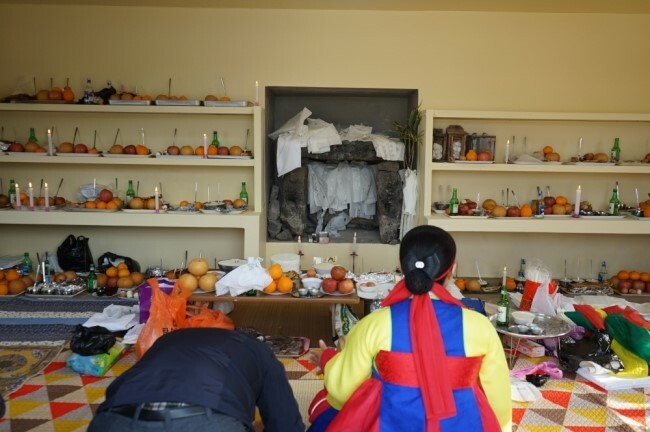 The Chilmeoridang Yeongdeunggut, held at Chilmeoridang shrine in Gunip-dong Jeju-si, was registered by itself as an intangible cultural heritage. Jeju Province plans to put in 118 million won this year in projects to preserve and support the Haenyeogut. The government has decided to provide funding for 30 communities in the province who applied for preservation project funding. An official of Jeju said, "We know from records that a diverse range of Haenyeogut was widely performed across the entire island. While the culture has been preserved in the eastern part of the island, the tradition was lost in places like Daejeong-eup and Hankyung-myeon, where there was influence by other religions early on."